The Drop Site example accepts drops from other applications, and displays the MIME formats provided by the drag object. There are two classes, DropArea and DropSiteWindow, and a main() function in this example. A DropArea object is instantiated in DropSiteWindow; a DropSiteWindow object is then invoked in the main() function. The DropArea class is a subclass of QLabel with a public slot, clear(), and a changed() signal. These event handlers are further explained in the implementation of the DropArea class. In the DropArea constructor, we set the minimum size to 200x200 pixels, the frame style to both QFrame::Sunken and QFrame::StyledPanel, and we align its contents to the center. Also, we enable drop events in DropArea by setting the acceptDrops property to true. Then, we enable the autoFillBackground property and invoke the clear() function. The dragEnterEvent() event handler is called when a drag is in progress and the mouse enters the DropArea object. For the DropSite example, when the mouse enters DropArea, we set its text to "<drop content>" and highlight its background. Then, we invoke acceptProposedAction() on event, setting the drop action to the one proposed. Lastly, we emit the changed() signal, with the data that was dropped and its MIME type information as a parameter. For dragMoveEvent(), we just accept the proposed QDragMoveEvent object, event, with acceptProposedAction(). The DropArea class's implementation of dropEvent() extracts the event's mime data and displays it accordingly. The mimeData object can contain one of the following objects: an image, HTML text, plain text, or a list of URLs. If mimeData contains an image, we display it in DropArea with setPixmap(). If mimeData contains HTML, we display it with setText() and set DropArea's text format as Qt::RichText. If mimeData contains plain text, we display it with setText() and set DropArea's text format as Qt::PlainText. In the event that mimeData contains URLs, we iterate through the list of URLs to display them on individual lines. If mimeData contains other types of objects, we set DropArea's text, with setText() to "Cannot display data" to inform the user. We then set DropArea's backgroundRole to QPalette::Dark and we accept event's proposed action. The dragLeaveEvent() event handler is called when a drag is in progress and the mouse leaves the widget. For DropArea's implementation, we clear invoke clear() and then accept the proposed event. The clear() function sets the text in DropArea to "<drop content>" and sets the backgroundRole to QPalette::Dark. Lastly, it emits the changed() signal. The DropSiteWindow class contains a constructor and a public slot, updateFormatsTable(). The class also contains a private instance of DropArea, dropArea, QLabel, abstractLabel, QTableWidget, formatsTable, QDialogButtonBox, buttonBox, and two QPushButton objects, clearButton and quitButton. In the constructor of DropSiteWindow, we instantiate abstractLabel and set its wordWrap property to true. We also call the adjustSize() function to adjust abstractLabel's size according to its contents. abstractLabel = new QLabel(tr("This example accepts drags from other "
"applications and displays the MIME types "
Then we instantiate dropArea and connect its changed() signal to DropSiteWindow's updateFormatsTable() slot. We now set up the QTableWidget object, formatsTable. Its horizontal header is set using a QStringList object, labels. The number of columms are set to two and the table is not editable. Also, the formatTable's horizontal header is formatted to ensure that its second column stretches to occupy additional space available. Two QPushButton objects, clearButton and quitButton, are instantiated and added to buttonBox - a QDialogButtonBox object. We use QDialogButtonBox here to ensure that the push buttons are presented in a layout that conforms to the platform's style. The clicked() signals for quitButton and clearButton are connected to close() and clear(), respectively. For the layout, we use a QVBoxLayout, mainLayout, to arrange our widgets vertically. We also set the window title to "Drop Site" and the minimum size to 350x500 pixels. We move on to the updateFormatsTable() function. This function updates the formatsTable, displaying the MIME formats of the object dropped onto the DropArea object. First, we set QTableWidget's rowCount property to 0. Then, we validate to ensure that the QMimeData object passed in is a valid object. In our example, format is the variable and the container is a QStringList, obtained from mimeData->formats(). Note: The formats() function returns a QStringList object, containing all the formats supported by the mimeData. 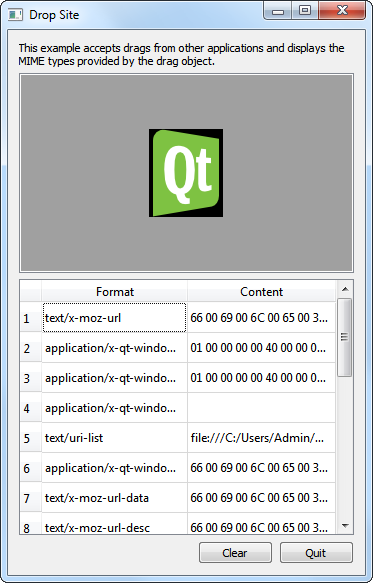 Within each iteration, we create a QTableWidgetItem, formatItem and we set its flags to Qt::ItemIsEnabled, and its text alignment to Qt::AlignTop and Qt::AlignLeft. A QString object, text, is customized to display data according to the contents of format. We invoke QString's simplified() function on text, to obtain a string that has no additional space before, after or in between words. If format contains a list of URLs, we iterate through them, using spaces to separate them. On the other hand, if format contains an image, we display the data by converting the text to hexadecimal. Once text has been customized to contain the appropriate data, we insert both format and text into formatsTable with setItem(). Lastly, we invoke resizeColumnToContents() on formatsTable's first column. Within the main() function, we instantiate DropSiteWindow and invoke its show() function.